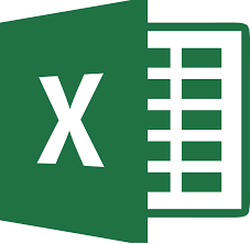 Summary: Excel provides a number of built-in worksheet functions for rounding numbers. The exact function you should use depends on exactly what you need to do with a value. The num argument is the number you want to round, while digits indicate how many digits you want the result rounded to. If digits is a positive value, then it represents the number of decimal places to use when rounding. Thus, if digits is 3, then num is rounded to three decimal places. If digits is zero, then ROUND returns a rounded whole number. If digits is a negative number, then ROUND returns a number rounded to the number of tens represented by digits. Thus, if digits is –2, then ROUND returns a number rounded to the nearest 100. Two other worksheet functions that return rounded values are ROUNDUP and ROUNDDOWN. These functions use the same arguments as ROUND and behave virtually identically. The only difference is that ROUNDUP always rounds num up, meaning away from 0. ROUNDDOWN is the opposite, always rounding down, toward 0. Summary: If you have rather large pricing tables, you may not know the best way to update the prices by the ten percent. Obviously, you could make a secondary table and then base the information in that table on a formula, such as =B3 * 1.1. This is actually more work than is necessary, however. There is a much quicker way to update values in a table by a uniform amount. Select an empty cell, somewhere outside the range used by your pricing table. Enter the value 1.1 in the empty cell. With the cell selected, press Ctrl+C to copy its contents to the Clipboard. Select the entire pricing table. You should not select any headers or non-numeric information in the table. Choose the Paste Special option from the Edit menu. 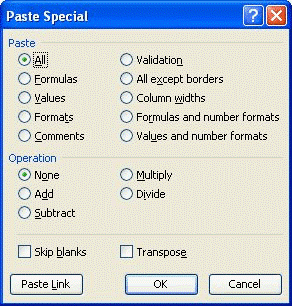 Excel displays the Paste Special dialog box. In the Operation area of the dialog box, select the Multiply option. Select the cell where you entered the value in step 2. You are done. All the values in your pricing table now show a ten percent increase from their previous values. Summary: Hyphenation is the process of adding hyphens to words at the beginning of lines so the hyphenated part will fit at the end of the previous line. The hyphens are inserted between syllables in a word. Word can automatically hyphenate your document for you, or you can use the hyphenation tool to manually hyphenate your document. Go to the beginning of your document (this is not necessary but saves time when hyphenating). In the Page Setup group, click the Hyphenation tool. Word displays a series of choices. Select Hyphenation Options. 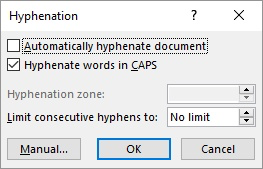 Word displays the Hyphenation dialog box. Use the controls in the dialog box to specify parameters of how the hyphenation is done. Select the Automatically Hyphenate Document check box if you want Word to make all the hyphenation decisions for you. When you subsequently click on OK, you can skip the rest of these steps. Click on the Manual button. You are shown the first possible hyphenation. If the word being proposed for hyphenation is long enough, you may be able to specify a different place for it to be hyphenated. Simply click on one of the proposed hyphenation points. Click on Yes to hyphenate the word at the noted point or click on No to skip hyphenating the word. You are then shown the next possible hyphenation. Repeat steps 9 and 10 for the remainder of the document. We hope that you are enjoying our monthly newsletter featuring tips that will help you to be more effective using Microsoft Office products. Summary: The Excel SUBTOTAL function returns an aggregate result for the supplied values. SUBTOTAL can return a SUM, AVERAGE, COUNT, MAX, and others. The SUBTOTAL function can either include or exclude values in hidden rows.